Just a little inspiration to get you started. I like to set mine up starting Thanksgiving since it kicks off the holiday season. It is for everyone to enjoy both young and old. 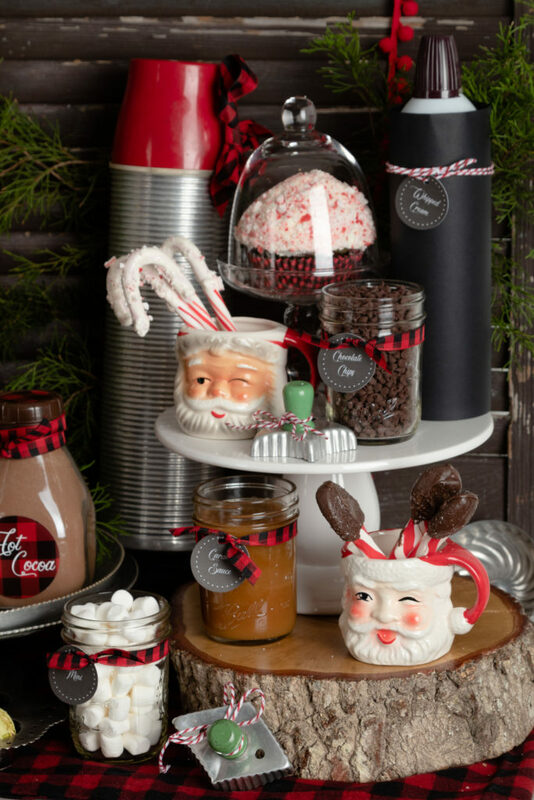 It is fun to pick a theme and change it up a little year to year, but I always include my vintage Santa mugs. Start out with a list of goodies you would like to offer as toppings and then some munchies too. The chocolate dipped pretzels add some salt and sweet. Marshmallows are a must. With that in mind I decided to offer both mini and large marshmallows. Chocolate chips, peppermints, m&m’s, and the best I saved for last, homemade caramel sauce. 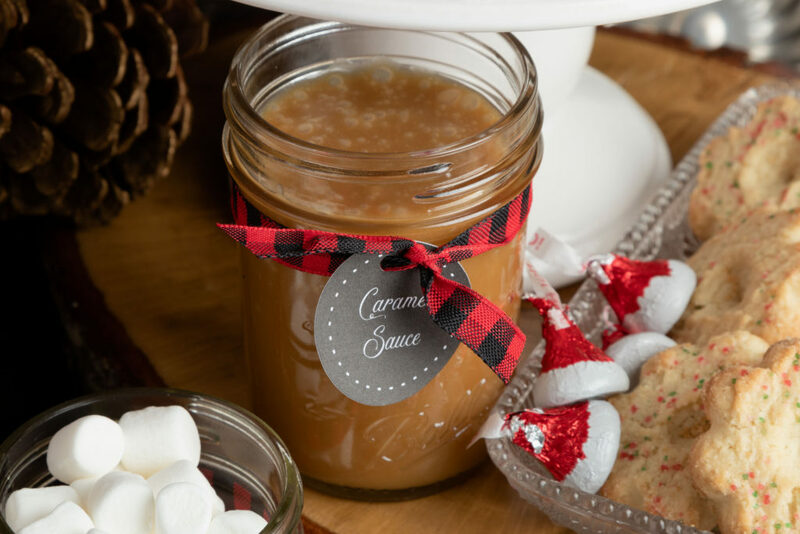 My son made the caramel sauce in minutes with only three ingredients. Find this wonderful caramel sauce recipe from Flusterbuster.com HERE. Macaroons, cookies, whipped cream, chocolate kisses and cupcakes are some of my favorite sweets, so I added those to my hot cocoa bar. 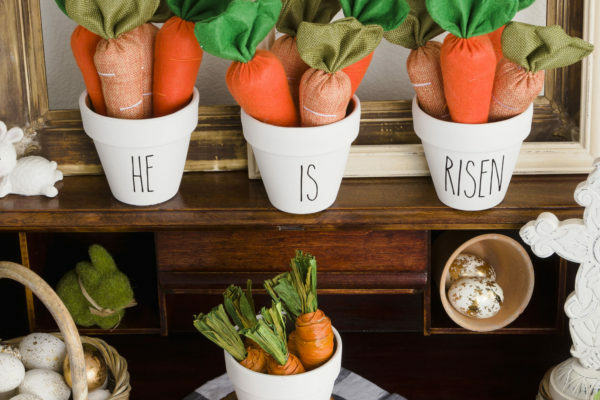 You can add whatever your family and guests like so it is special too. 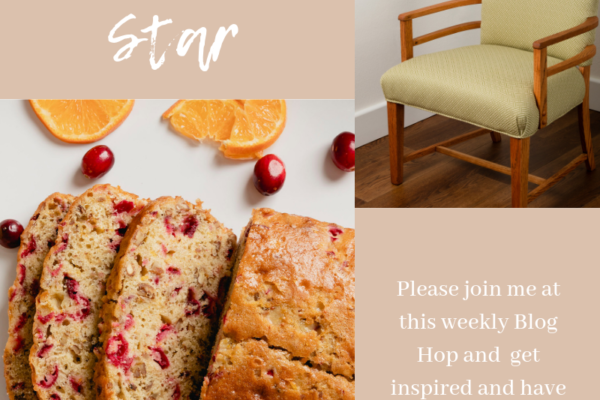 Gather your recipes, list of goodies and any display items needed. Once you have everything gathered you are ready to bake and cook items for the bar. 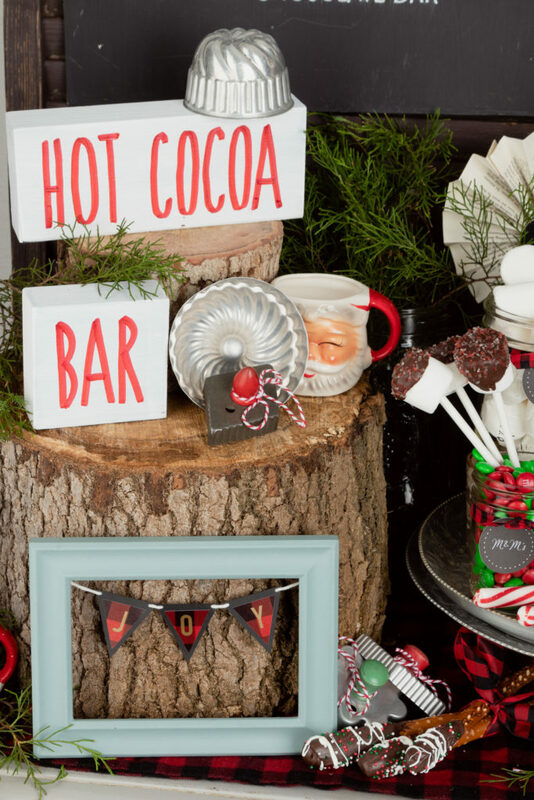 Find a small area to setup the hot cocoa bar (hot chocolate bar) or hot cocoa station. A section of the kitchen counter can work or something more elaborate like a buffet. Years ago when my children were young I used a vintage cabinet in my kitchen, but now I have moved it to the living room. This year I used rustic, vintage and buffalo check. The wood slices were from a tree in my yard therefore they were free. All the vintage items I already owned, so no expense there either. All the jars I owned, but the ribbon I purchased and the cute labels I made. The labels are available for you as a free download at the end of the post. I added a memo board I made with a printable you can download to add to your the bar. You can see it in the photo below. 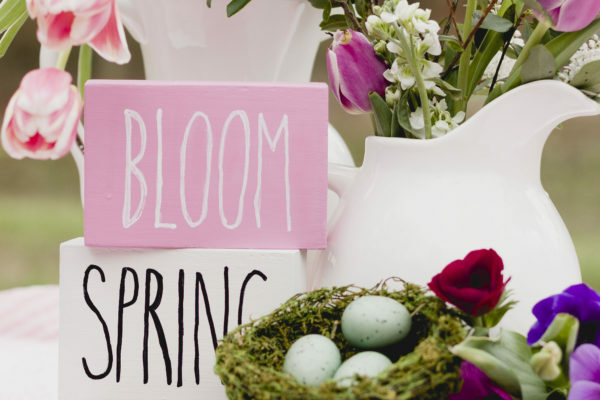 The below photo includes the handmade Rae Dunn inspired block signs. You can whip these up in a flash. Check out how to make some HERE. The blue frame with the joy banner was made by my daughter with her Cricut. If you would like the easy instructions please let me know in the comments. 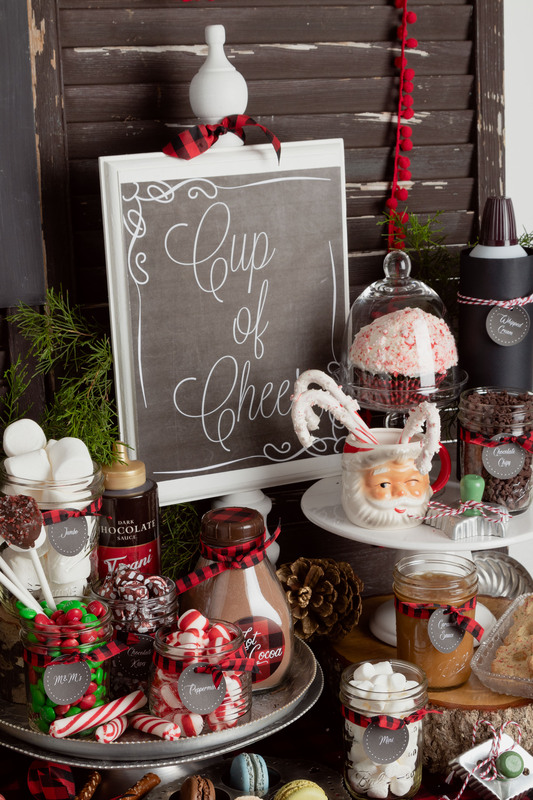 I will gather all the items to craft your hot cocoa bar at the end of this post. Place all of your display items on the bar. 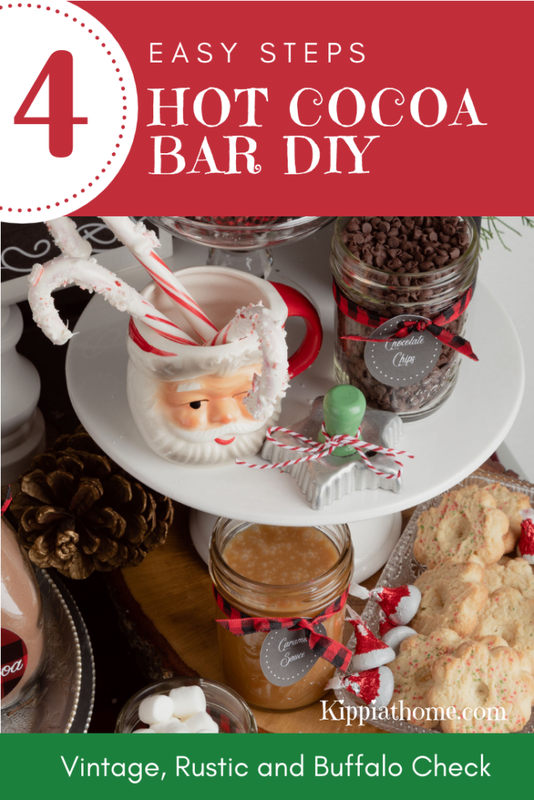 Once you are happy with the display take off your jars and fill them with the goodies and tie your labels on with ribbon or bakers twine. I taped construction paper around the whipped cream can and then added the label with bakers twine. I added bakers twine to the vintage cookie cutters too. After everything was on the bar I added cedar branches that I cut from my yard, also free. 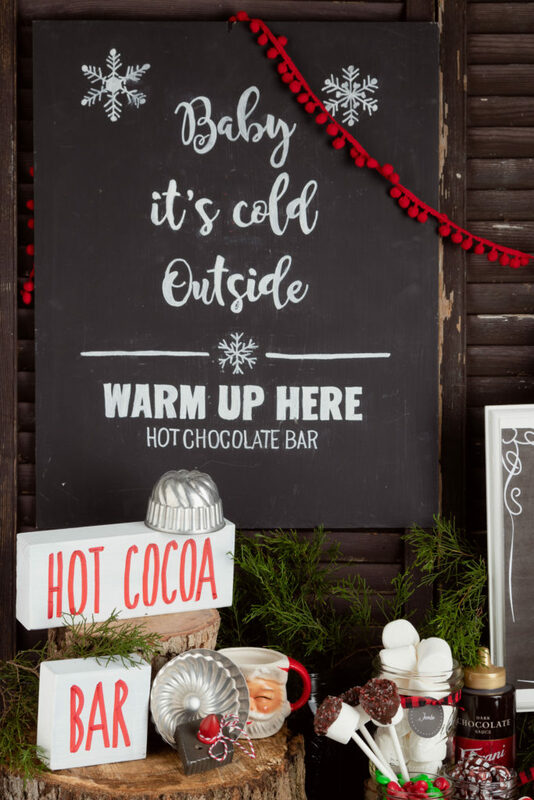 The Baby it’s cold outside sign was made for the hot cocoa bar a few years ago, but I love it so I added it again. Here is a pin for your Christmas Pinterest boards. Next on the tour are two amazing bloggers. 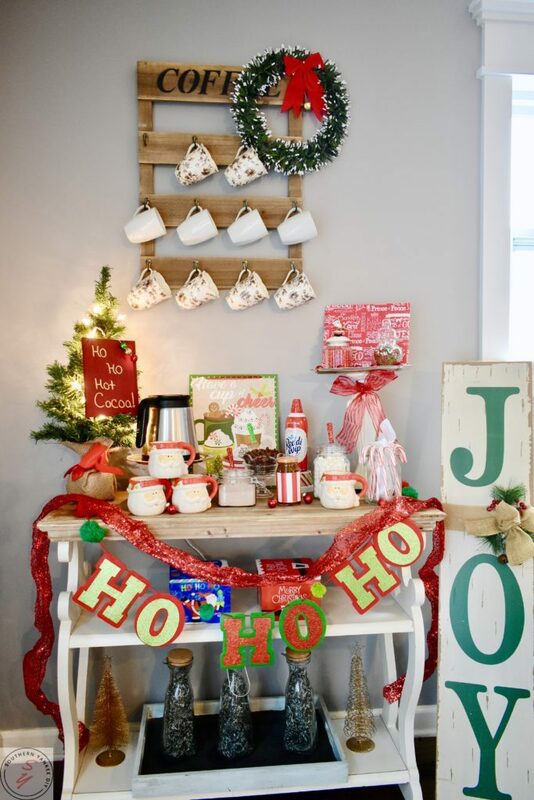 First is Lia’s Southern Yankee DIY ‘s Hot Cocoa Bar. 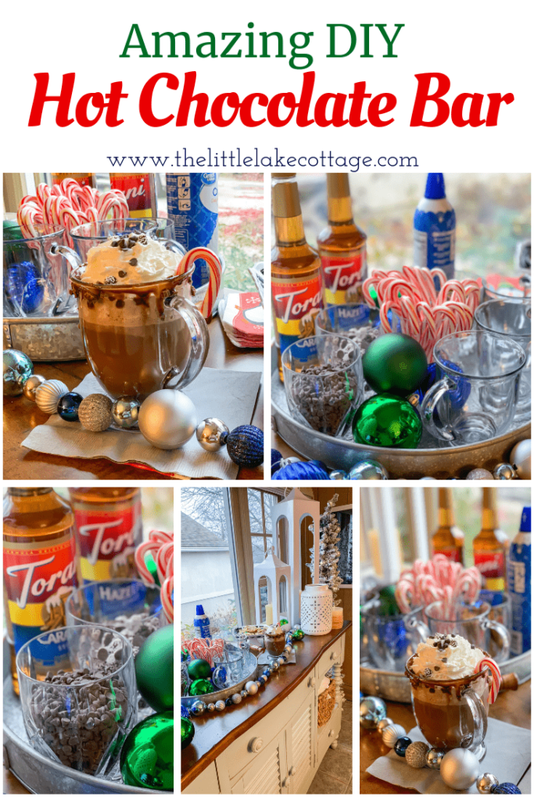 My friend, Lia has been enjoying the south, but it got a wee bit chilly, so she set up her hot cocoa bar early to warm up sipping hot cocoa in front of the fire. See more of her post HERE. I adore those greens and blues in Lauren’s decor. She has two young son’s who were her helpers. Job well done fellas! Read more about her post HERE. Wow, that was fun and super sweet. I hope you have enjoyed this post as much as I did putting it together. 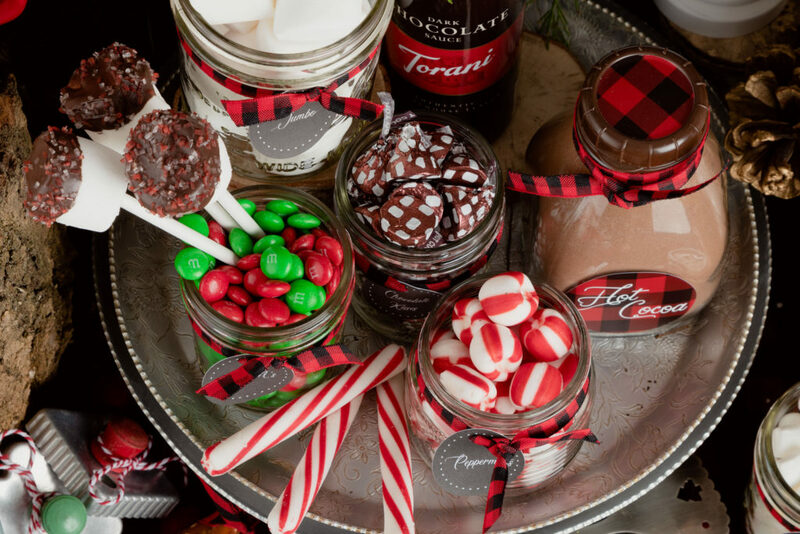 Please leave a comment about your plans for a hot cocoa bar.